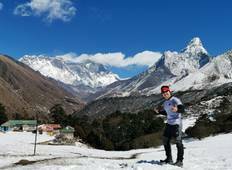 "After 7 seasons of high altitude trekking in Nepal I would only recommend Dil Gurung..."
"We had an amazing trek with Ace. Our guide was caring and knowledgeable, the route..."
"This trek was physically and mentally demanding, but was worth every bit of effort!..." "It has been a wonderful experience. 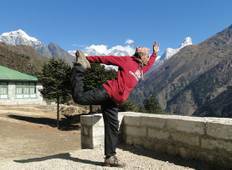 All the management of the trekking and the attention..."
"It was my awesome trip. I never had before in my life. Everything was perfect . Meals..."
"I'm so happy i found these guys, Obviously been doing this for a while, they made..."
"Bastante bem organizado, fiz o tour no Butão e o trekking no EBC e em ambos os casos..."
"“Our trip to trek Everest Base Camp was great in every transcending level, definitely..."
"“Our trip was a truly unique, unforgettable experience. With just two people in..."
"I did the EBC Trekking with Accessible Adventures last October 2018. Santosh was..."
"Amazing!!! We visited Nepal (Kathmandu & Pokhara) for the first time in October 2017..."